There are 17 construction projects listed here and none are about automobiles. Additionally, there is information about 2 studies for bus rapid transit-like projects. Download all of these into Google Earth with this KML file. A couple of these projects are being held up by the current Illinois roadway construction workers’ strike. UPDATE: Apparently a deal has been reached to end the strike. Blue Island/Cermak – I wrote about this project at length in October 2009. Construction should begin as soon as the strike is resolved. CONSTRUCTION UPDATE, 10-21-10: Bioswale, or creek, is mostly complete at Benito Juarez Community Academy (BJCA). Plaza with permeable pavers, and sheltered bike parking also complete. Photos here. Congress Parkway – Full details and renderings from CDOT (PDF). Project should begin in 2010 and will narrow lanes, reduce number of lanes, straighten lanes (no more mid-intersection lane shifts), widen sidewalks, and improve crosswalks. Will add a lot of landscaping and unique and decorative lighting. PROPOSED: Lawrence Avenue between Ashland and Western. Reduce the number of travel lanes from four to three, adding bike lanes and a center turn lane. Project limits include the rebuilt Ravenswood Metra station at 1800 W Lawrence. More details on Center Square Journal. Construction wouldn’t begin until 2011. 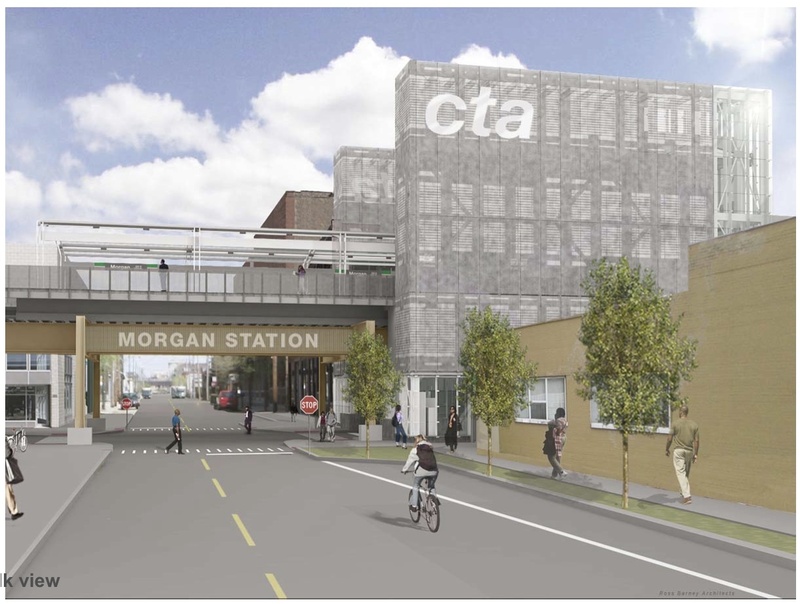 Morgan/Lake Green and Pink Line CTA station (new) – Details and renderings from CDOT (PDF) – Overview from Chicago Transit Authority – Tons of bike parking included at the beginning, how it should be. Construction should start this year. To better serve the West Loop area, where more people are moving to, but also has lots of existing businesses. State/Grand Red Line CTA station renovation – Construction should finish this year. 35th/Federal Rock Island Metra station (new) – Construction started in 2010. LaSalle/Congress Intermodal Center – To improve connection between buses and the LaSalle Metra station. Mentioned in the Congress Parkway streetscape presentation (PDF). Wilson Red Line CTA station renovation – Down the street from a new Target store that opens this weekend and hundreds of brand new housing units in the Wilson Yard development. Will use TIF funds from the Wilson Yard district. Overview on CTA Tattler. Ravenswood Metra Station – A popular station on the Union Pacific-North line (to Kenosha). Will add longer and sheltered platform and become accessible. Details with Chicago Square Journal. FLOATING: New Green Line CTA station at 18th or Cermak. Roosevelt station serves three lines. South Loop neighborhood fast growing. The new station would improve transit access to McCormick Place (at least if built at Cermak). Follow the Chicago Journal for more news on this topic. Rendering from the Chicago Department of Transportation (CDOT) showing context-sensitive design. See the full presentation (PDF)Â for architectural influences. Halsted Street over North Branch Canal of the Chicago River. Replaces 99-year old moveable span with fixed span. No information on how it will accommodate the Halsted Street bike lane. Construction to begin in 2010 (PDF). CDOT project number 74062. Navy Pier Flyover – Elevated section of the Lakefront Trail to bypass current bottleneck where the Lakefront Trail currently enters the Lake Shore Drive bridge over the Chicago River and DuSable park. Details from CDOT presentation on July 15, 2010. PROPOSED: 35th Street pedestrian bridge over Metra/Illinois Central tracks and Lake Shore Drive to lakefront and Lakefront Trail. Bridge will be self-anchored suspension, like the new Bay Bridge from Oakland to San Francisco. Overview on Burnham Centennial (drawing says 2007). Rendering of the Navy Pier Flyover as it travels over the Lakepoint Tower condominiums as seen at the Cities and Bicycles forum with David Byrne in June at the Chicago Cultural Center. Various CREATE projects. All CREATE projects involve railroads in some way and most projects will construct grade separations. I’ve written about CREATE. The Chicago Park District opened a new beach at Oakwood/41st Street this year. The grand opening for the beach house happened this past Saturday. 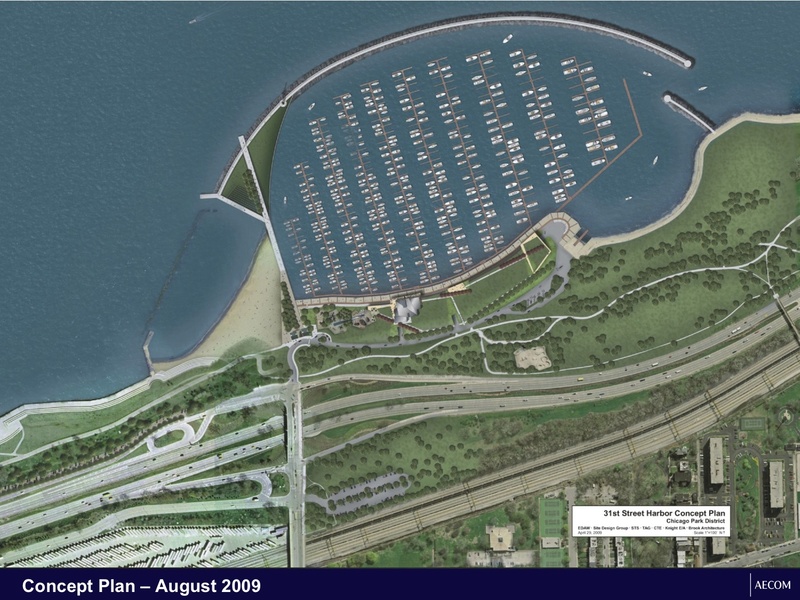 The Chicago Park District is currently building a harbor and marina immediately south of the 31st Street beach. The Public Building Commission of Chicago has the details and renderings. AECOM, the architect of record, produced these concept drawings (PDF). It appears how bike riders currently navigate the intersection at the entrance to the beach will change to be a little more normal and not force bike riders on the sidewalk. It’s unclear how many new parking spaces are being created along the lakefront – the fewer the better. The concept plan shows a new parking lot on the west side of the railroad tracks, a design I wholly support. FLOATING: Luann Hamilton mentioned at the Cities and Bicycles forum with David Byrne in June that CDOT was thinking about a buffered bike lane on Wells Street. Rendering of the 31st Street harbor concept plan. As seen in the contractor’s presentation to the Public Building Commission of Chicago. Although not construction projects, two additional proposals merit your attention. The Chicago Department of Transportation and the Chicago Transit Authority each received grants this month to study and develop two corridors with bus rapid transit-like features. CDOT’s plan is to develop a priority bus lanes for up to seven routes between the Metra stations and Navy Pier and North Michigan Avenue (the Miracle Mile). Thank you to Kevin Z for the update. CTA’s grant money is to fund the development of a speedy bus service from the southeast side to the West Loop via the north-south Jeffrey Avenue.